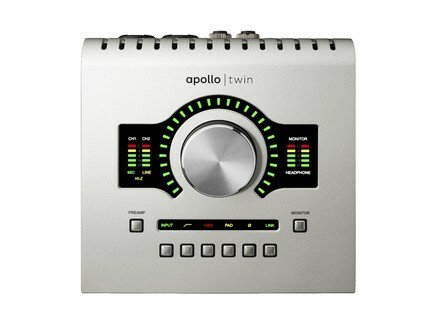 Apollo Twin Duo, Thunderbolt audio interface from Universal Audio in the Apollo series. We could see this Apollo coming, but it's nevertheless with great pleasure that we discovered the compact version of the now famous Apollo during the last NAMM. 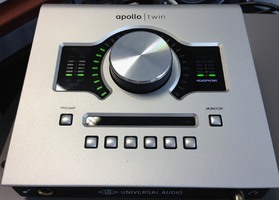 The first Apollo, even if limited by its 1U rack format, was very nice looking, and this Twin version, in desktop format, retakes a similar design. 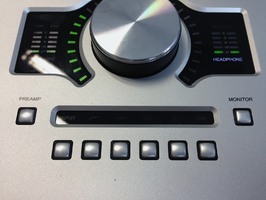 It features the same brushed aluminum finish, the same small buttons and a big clickable knob (thanks to the desktop format!). All in all, it seems to be very sturdy and it inspires confidence. Still, the interface appears less imposing than an Apogee Duet or an RME Babyface (its dimensions are 6.3" x 2.6" x 5.9") and it weighs 2.35 lbs (two times as much as a Babyface). One last detail excludes it once and for all from the mobile interface category: The Twin must be connected to the mains to work, and the choice of using Thunderbolt exclusively make it incompatible with smartphones and tablets. A real pity. The Twin's first big difference with regard to its bigger sibling is the lack of FireWire. That means you will need a relatively recent Mac with a Thunderbolt port in order to use it (it will not work on non-Thunderbolt Macs with an adapter cable, and at the moment, UA doesn't offer anything for Windows). While this decision will certainly leave some users behind, it is understandable considering that Apple dropped FireWire ports from all its computers, thus signaling the end of the bus type on Macs. The Twin uses PCIe drivers for all audio and plug-ins ─ plug-ins which will be obviously available for its two older siblings. 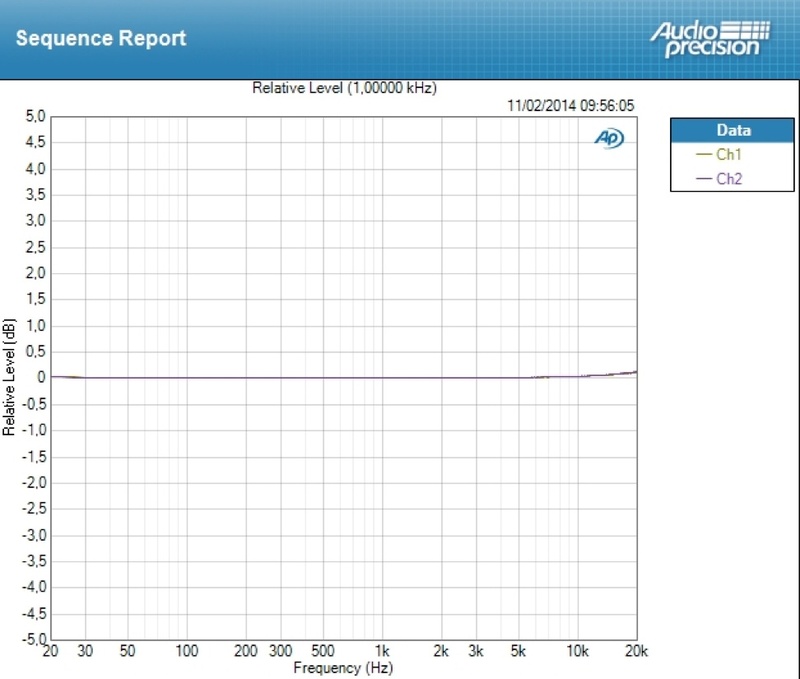 In theory, the frequency range is pretty large, even if the gain still needs to prove itself in practice, especially on an interface with only a couple inputs/outputs, like the Twin. The interface is pretty well thought-out in terms of usability, with the headphone output and the instrument input located on the front, and the rest on the rear panel: The two mic/line inputs with XLR/1/4" TRS/TS combos, the pair of 1/4" TRS/TS Line outs (to send the signal to another device) and Monitor outs (for the speakers; analog, but digitally controlled, which is great), the optical TOSLINK input (ADAT or SPDIF), the Thunderbolt port, and the connector for the power supply, together with the power switch. 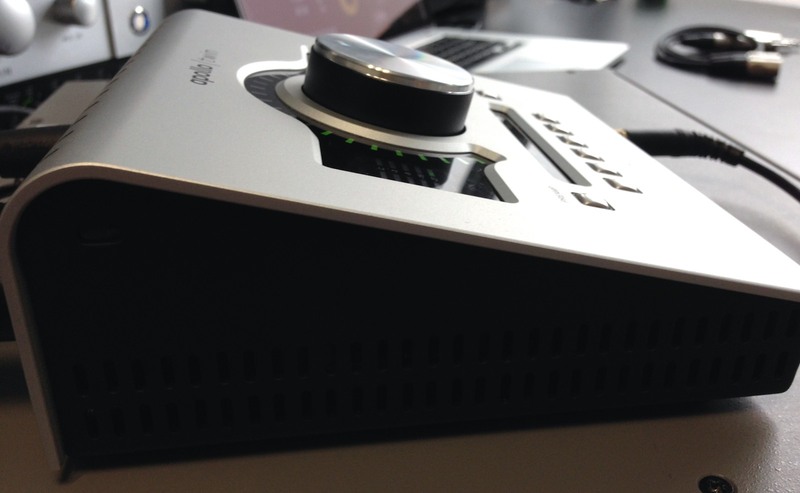 We regret the absence of a second Thunderbolt port to daisy chain an HDD or another interface. Given the bandwidth offered by the connection, it's a pity not to be able to profit from it. Especially since some Macs only have one port. 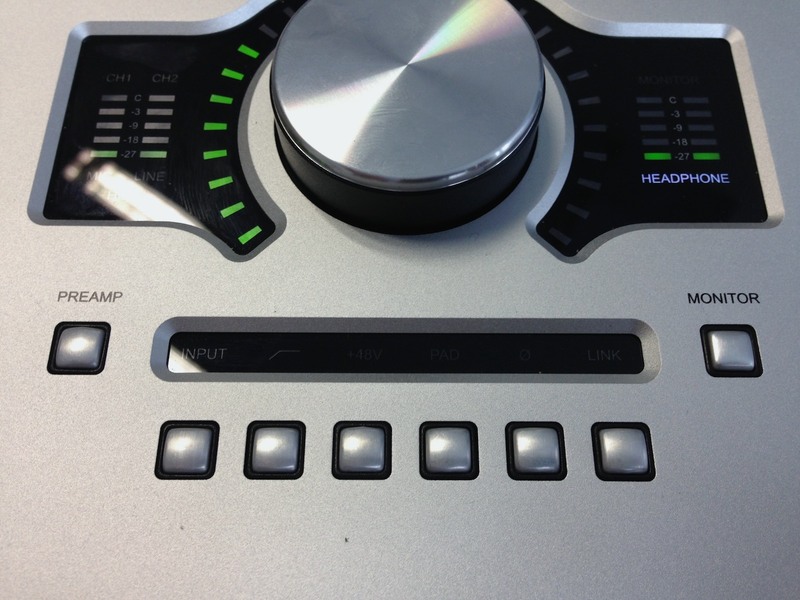 It's impossible to ignore the big clickable knob on the front panel. By clicking "Preamp" or "Monitor," it controls either the gain of the preamps (1 or 2) or the volume of the Monitor output (which can also be muted it by clicking on it), Everything is surrounded by a series of LEDs, which indicates the preamp gain level or the level of the Monitor output, depending on the chosen function. To the left are the level indicators (five LEDs) for both inputs, and to the right the indicators for the monitor or headphone output. Right underneath that is a row of switches to activate/deactivate certain preamp functions: Mic/Line level selector, low-cut filter (75 Hz), 48 V phantom power, 20 dB pad, phase inverter, and channel link. The front panel is well designed and easily readable, and it gives you control over all main functions (preamp gain, speaker and headphones volume, 48 V, pad, etc.). 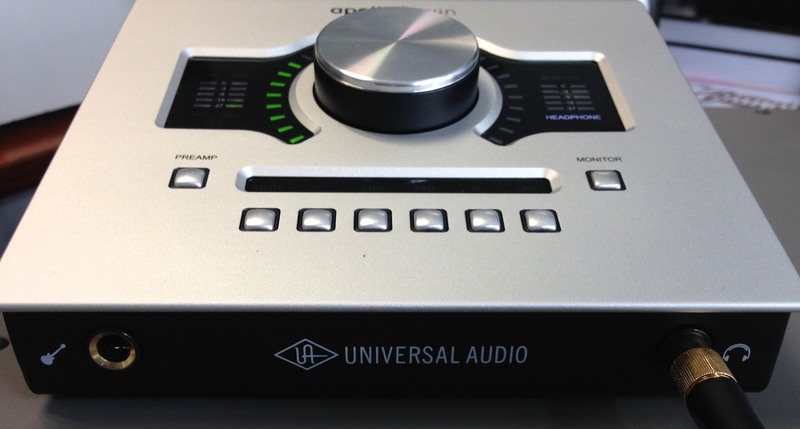 Universal Audio makes the best of the desktop format by offering a nice and practical interface: There's nothing to complain about. Once the interface is installed, you will see the virtual console that Apollo users know so well, and which we described in detail when reviewing the Apollo. 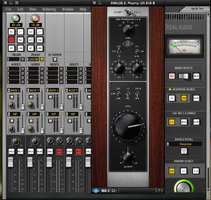 The console has been updated a couple of times (Mix-Merge mode, Pro Tools mode, software return, and Flex Routing, the latter not being available on the Twin), while preserving all the qualities that we like, namely its simplicity and efficacy. Certain criticisms, like that it only has two aux circuits, are acceptable with the Apollo Twin, since, in theory, you won't be needing more. 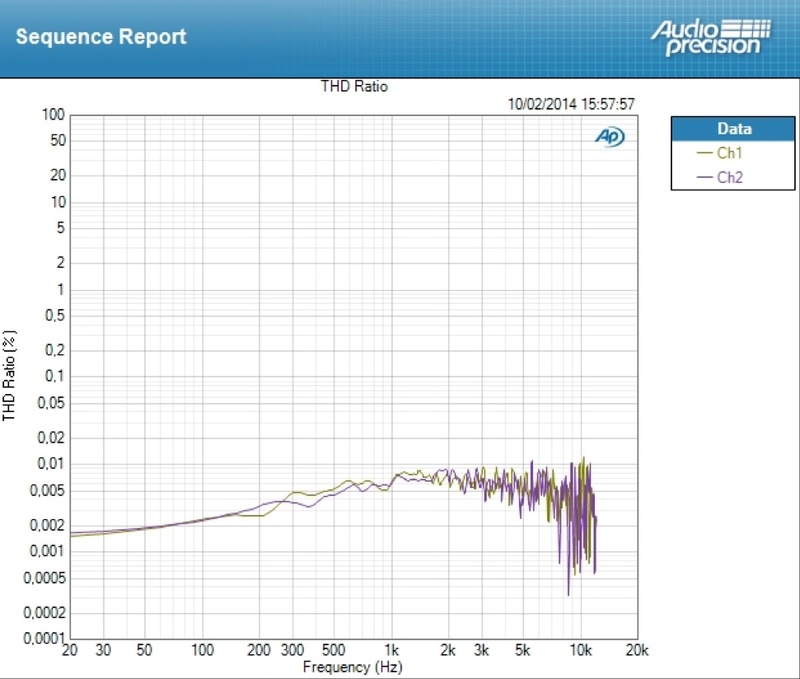 Outputs 3-4, as well as the headphone out, can have an independent mix, which is a good point. But the feature we will deal with longer is called Unison, which promises to be able to simulate a good old analog preamp with the Apollo Twin. 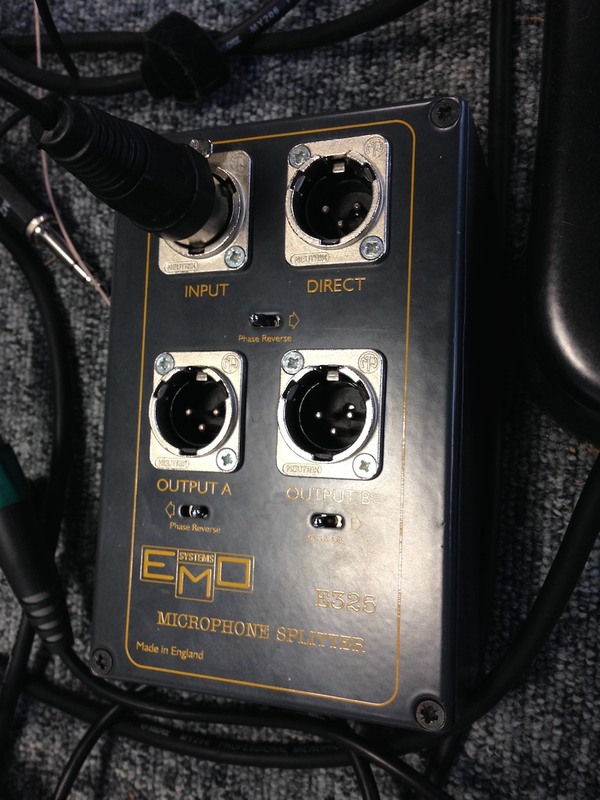 On the preamp section of the console there's a slot to load a "plug-in" for both mic inputs. The particularity of this technology, compared to a classic plug-in, lies in the interaction between software (the plug-in itself) and hardware (the preamp) of the Apollo. 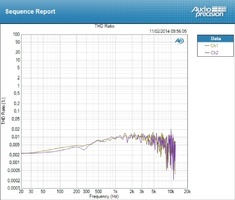 The Unison plug-ins can adjust the input impedance of the preamps and the response of the gain stage, as well as other built-in preamp parameters, in order to make them match the simulated preamp better. Thus, if you increase the gain directly on the Twin, you will also see the gain increase on the GUI of the plug-in. You can also select the gain stage to adjust (the color of the LEDs around the knob changes), since the Unison plug-in features several (up to three: Gain, Level, and output). Only one Unison plug-in is included with the Apollo Twin: A reproduction of the Universal Audio 610-B, which is part of the Realtime Analog Classics software bundle that comes with the unit. 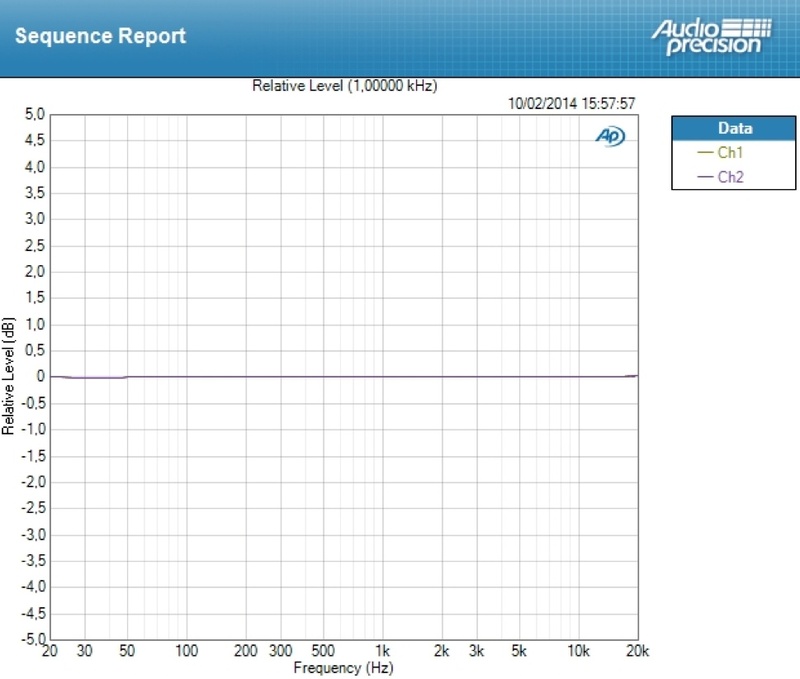 The 610-B is also available, along with the 610-A, an emulation of the classic Universal Audio preamp, in the UA 610 Tube Preamp & EQ Plug-In Collection, which you can purchase separately. Another UAD-2 plug-in, the API Vision Channel Strip, also offers a preamp with Unison functionality. 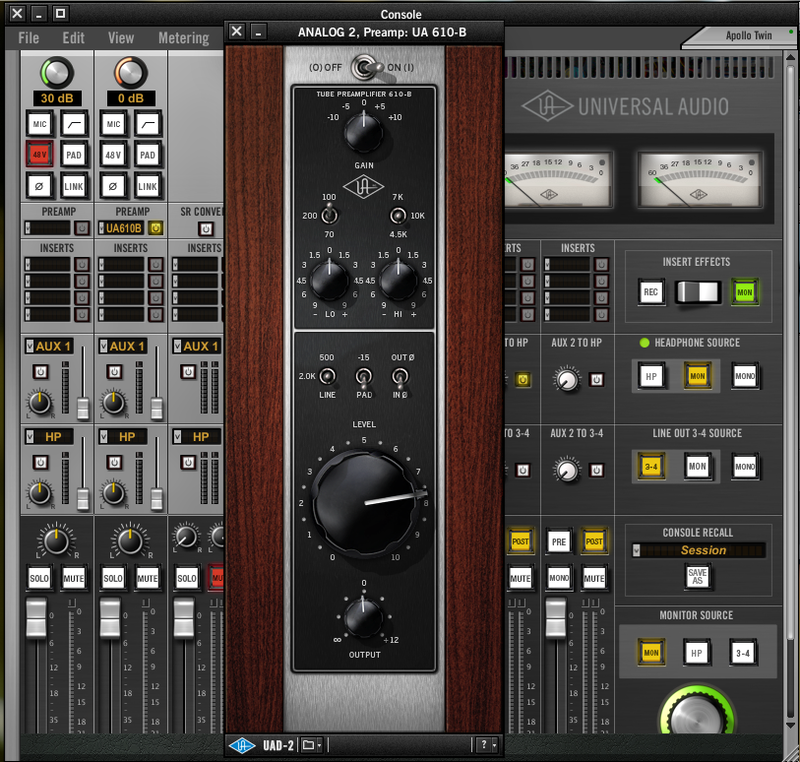 It is also important to note that if you load a Unison plug-in on an Apollo 16 (which has no preamps) or a UAD-2 card, there will be no hardware/software interaction. The result is quite subtle, but it will certainly suit those who want to give their recordings a certain color, while waiting for the upcoming simulations! The Apollo has the same preamps and converters as its bigger sibling, which means the audio quality ought to be the same And since we couldn't really do benchmarking when the first Apollo came out (we didn't have the necessary gear), we will take the opportunity to get our Audio Precision rack and take some measurements of the Twin in order to compare it with our Metric Halo ULN-8. As you can see, the Twin does very, very well against (and even better than) the ULN-8, which is a really high-end interface. 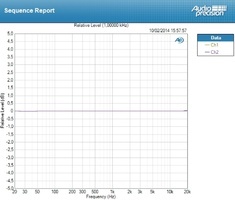 This only confirms the quality of the Apollo preamps and converters. 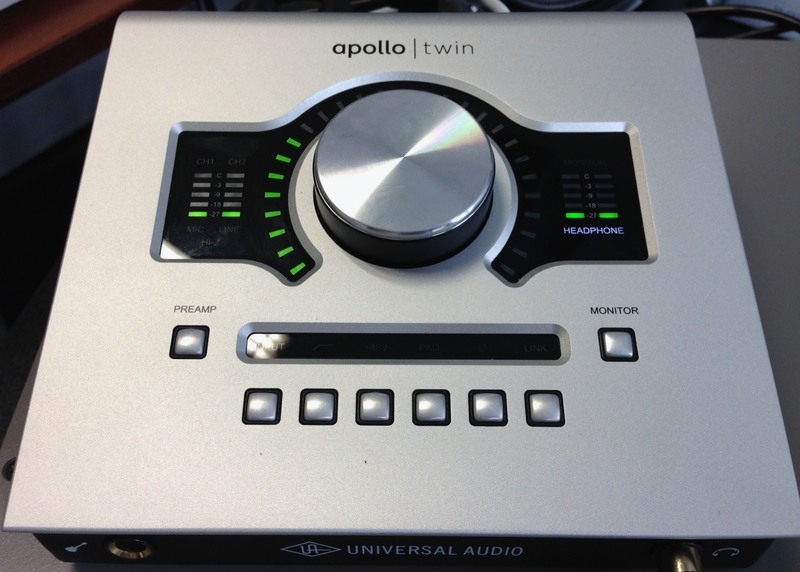 The only thing left to know is who the Apollo Twin (which is available in both Solo and Duo versions) is aimed at? 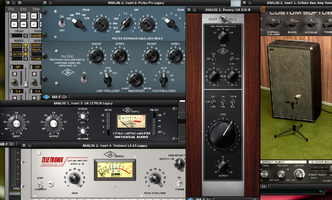 There's no Quad version, and knowing how resource-intensive the latest UAD plug-ins are, don't expect to be able to stack loads of them with your Twin, not even with the Duo. Having that in mind, it's even more of a pity that, for the time being, the interface cannot work together with another UAD/Apollo. Thus, the Twin must be considered as an interface that allows you to add some plug-ins to your recordings (especially the ENGL and Softube plug-ins for guitarists) without any audible latency (1.1 ms at 96 kHz). 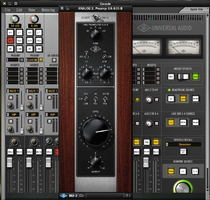 Plus, it opens the door to other UAD plug-ins, which are highly respected when it comes to vintage hardware emulations, even if you might have to use the "freeze" function of your sequencer if you want to use lots of them. The price of both versions (around $699 for the Solo and $899 for the Duo) seems quite alright in relation to similar products. 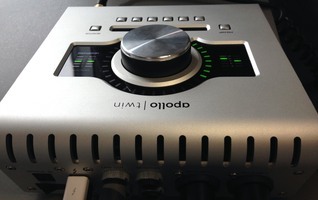 An Apogee Duet 2 costs around $595 and, except for iOS compatibility, offers much less than the Twin: No processing options, no digital input. The Babyface does have digital ins/outs and processing options, but doesn't have the same plug-in catalog as UAD ─ a catalog that remains the Apollo's best asset. 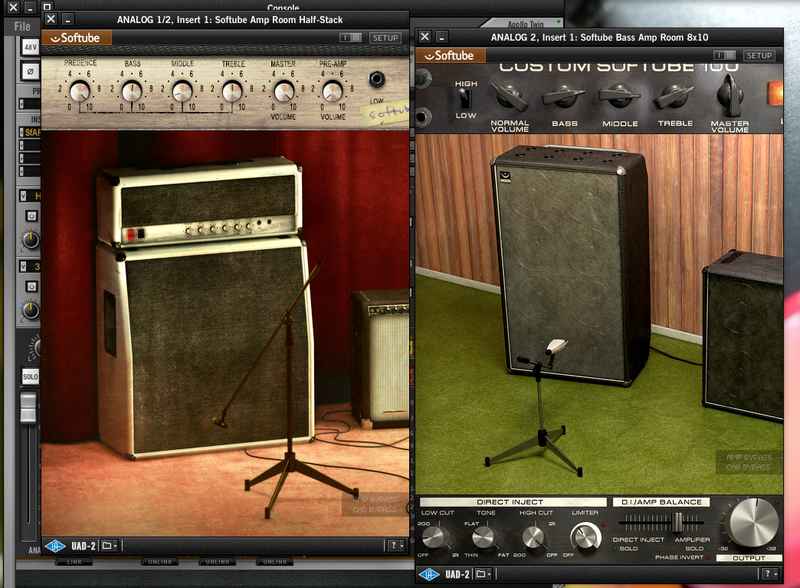 However, it remains to be seen if someone who spends $699 on a Twin is willing to invest in plug-ins that can cost up to $300. 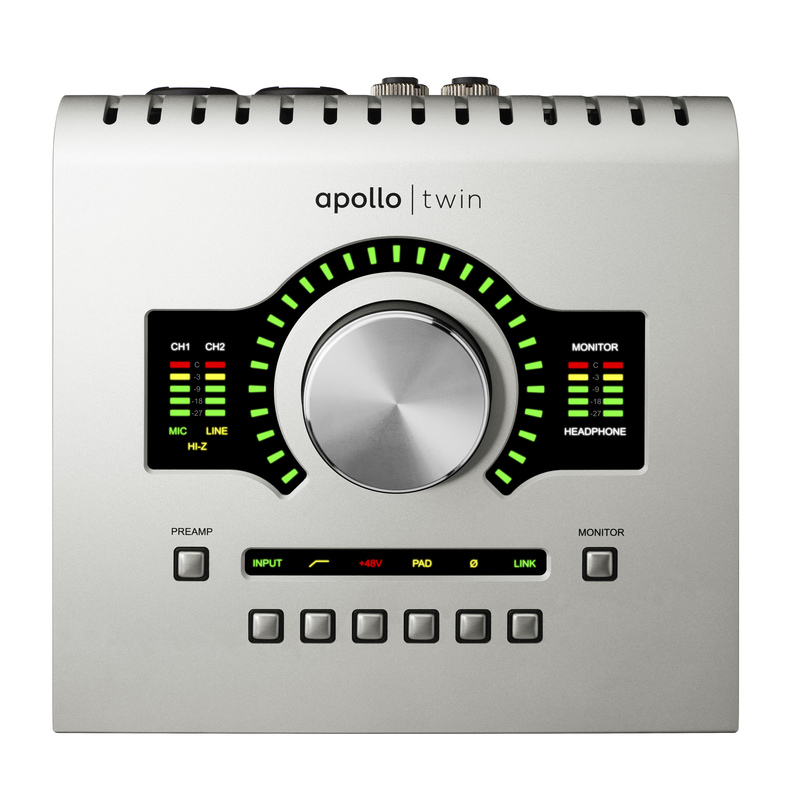 We had been expecting this small Apollo since the original one came out and the outcome hasn't disappointed us a bit: Its look and build are irreproachable, the usability, both in terms of software and hardware, is perfect, the quality of the preamps and converters is very good, and the price seems quite reasonable, given the features. The Unison technology is well thought-out and opens interesting doors, even if right now there's only one plug-in available. Opting for Thunderbolt exclusively will leave some potential users behind, as will its lack of Windows compatibility. Some others will also regret the impossibility to use it with their tablet and/or smartphone. 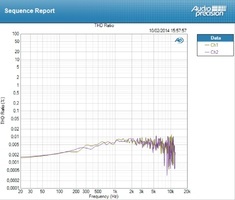 We hope that Universal Audio will soon authorize the daisy chaining of several UAD/Apollo interfaces, which will somehow compensate for the nonexistence of a Quad version. As for the rest, if you are looking for a quality interface in desktop format with two preamps and compatible with UAD plug-ins, the Twin is perfectly tailored for you.